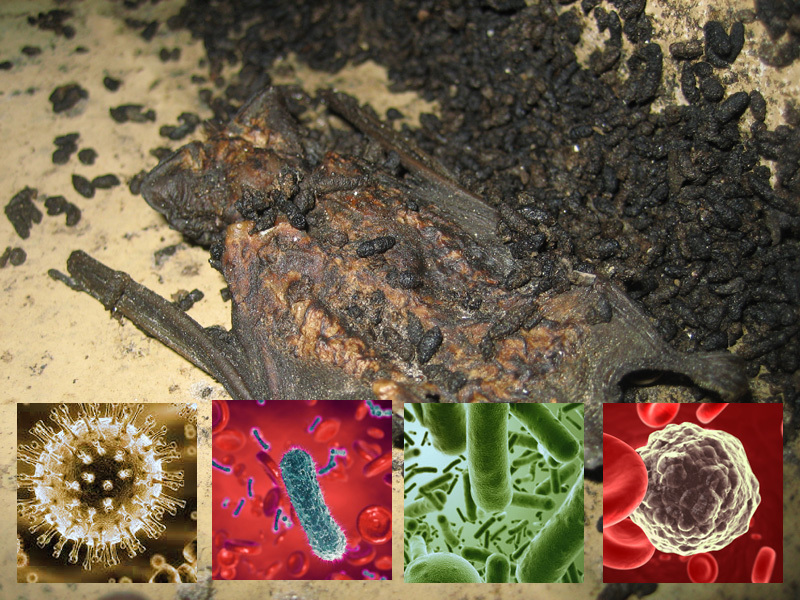 Bat Diseases - A very important concern that many people will have when they consider bats and particularly a bat colony in their area, is the kind of diseases that bats can carry and whether or not these diseases can be transmitted to people and animals. Bats have lived alongside people in many different situations for centuries, and the rates of disease transmission are generally quite low, but there are certain steps that can be taken to help reduce the possibility of transmission. One of the main issues in terms of bat diseases is rabies, but this only affects a relatively small part of the bat population, and there are also other conditions that are worth considering if you have discovered a bat colony nearby. One of the most important things to remember about bats is that although they constitute one of the biggest reservoirs of the disease in the United States, less than one per cent of all bats in the country actually carry the disease. While rabies is a very serious disease if you contract it, with only thirty six cases experienced in the United States in the fifteen years between 1995 and 2000, it is still a very rare condition. Most people will not come into contact with bats at all, but by simply treating them with respect and wearing protective clothing if you go into an attic or area where the bats are located, then you will usually be perfectly safe. There are several ways that bats can transmit diseases, but one of the most common can be through a bite, and in the majority of cases where rabies has been transmitted to people, it is a bat bite that has been the cause. This means it is very important to wear safety clothing such as thick clothing along with a mask and gloves if you are entering an area where there is a possibility that bats will be present. Diseases can also be transmitted through bat feces and through scratches from the animals, so it is always worth being careful, and if you do come into contact in this way with a bat, make sure you are treated by a doctor as soon as possible. Along with rabies, one of the most important diseases to be aware of when dealing with bats is histoplasmosis, which is caused by spores in the feces of the bat which becomes airborne when it is disturbed. Another condition that is found in the bat population in the United States is SARS, which is a serious disease that can cause problems that begin with flu-like symptoms and get gradually more serious. Again, SARS is another disease that is very rare, and the cases of the condition being transmitted to people from bats are very few and far between. Because the main conditions that can be transmitted from bats to humans are zoonotic, pets tend to be able to contract many of the same diseases that people can. One of the most common conditions that has been known to transmit between mammals is rabies, and while contact between bats and pets are quite rare, it is possible that a dog or cat will find or catch an injured bat and get a bite or scratch. Pets are also susceptible to histoplasmosis, and can suffer the same respiratory problems that people experience if they contract the condition. One of the biggest problems when dealing with bats is the droppings, or guano as it is known, but in many cases people won't know that it is there until they tread in it or disturb it while in an attic or a confined space. When going into these areas, try where possible to wear a breathing mask or something that will cover your mouth, as inhaling the spores from these droppings can be very dangerous. It is also important to dispose of the material properly, either by burying it or incinerating it, or sealing it in a double bagged garbage liner, which will prevent any spores from escaping. One of the most important conditions that is affecting bats in the United States at the moment is White Nose Syndrome, which is identified by a white fungus that grows on the snout of the bats. This is fatal as it means that bats wake more often during hibernation, and cannot preserve their fat stores throughout the winter, meaning that they cannot survive until spring when they would normally become active again. Some strains of other diseases may at times only affect bats, but these can vary so it is still best to be cautious when dealing with bats. What Diseases to Bats Carry? What kind of damage do bats cause in an attic?